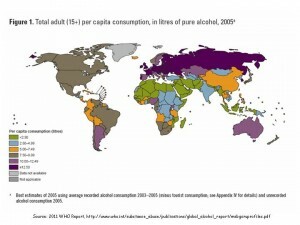 Having looked at the global patterns of consumption of milk and cheese, I will now take a look at alcohol consumption. As the maps on the left show, alcohol drinking habits vary drastically around the world. 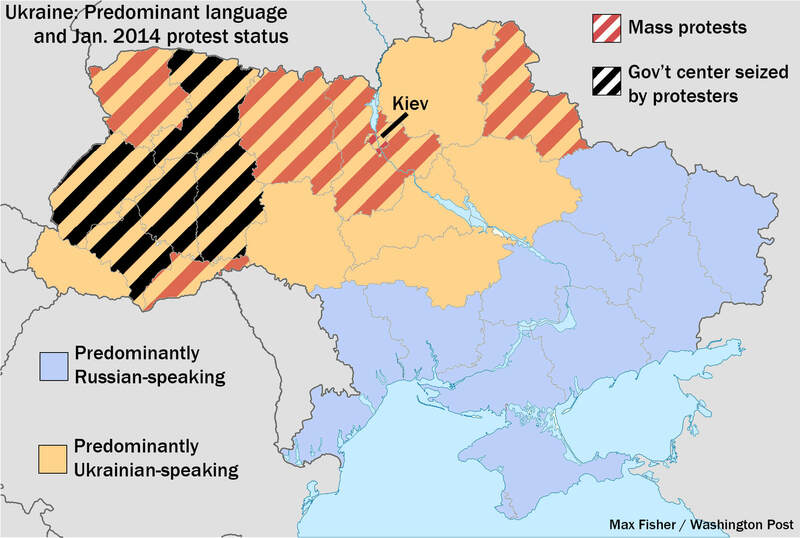 Such maps, however, need to be regarded with some skepticism. The blue-colored map above supposedly depicts data from 2008, but it appears to be incorrect in several areas. 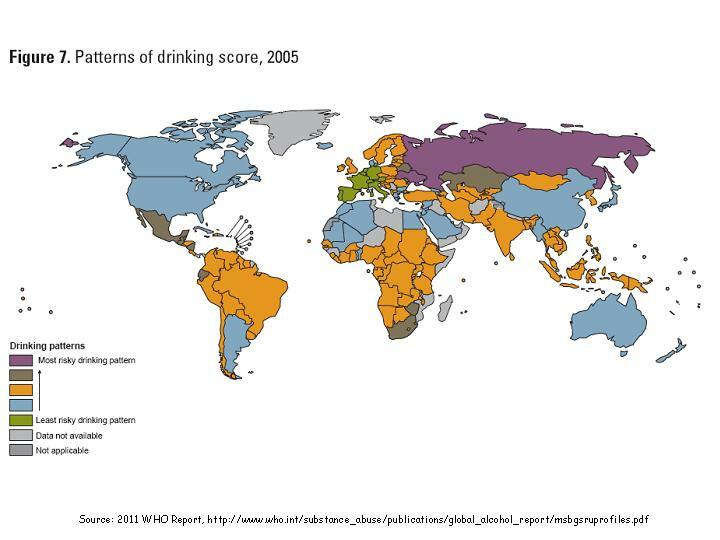 For example, Belarus and Ukraine are colored as consuming between 5-7 liters of alcohol per capita annually, whereas the multicolored map for 2005 from the 2011 report from the World Health Organization place those two countries in the “12.5 liters and above” category. 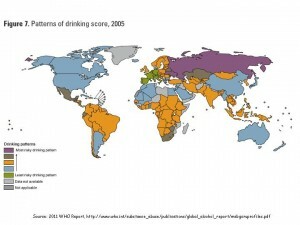 I doubt that alcohol consumption in Ukraine and Belarus has halved in just 3-5 years. Thus the WHO map appears to be more accurate; as a result, the remainder of this post will refer to that map, as well as to the map I have produced for GeoCurrents, which breaks down the same data into different categories. 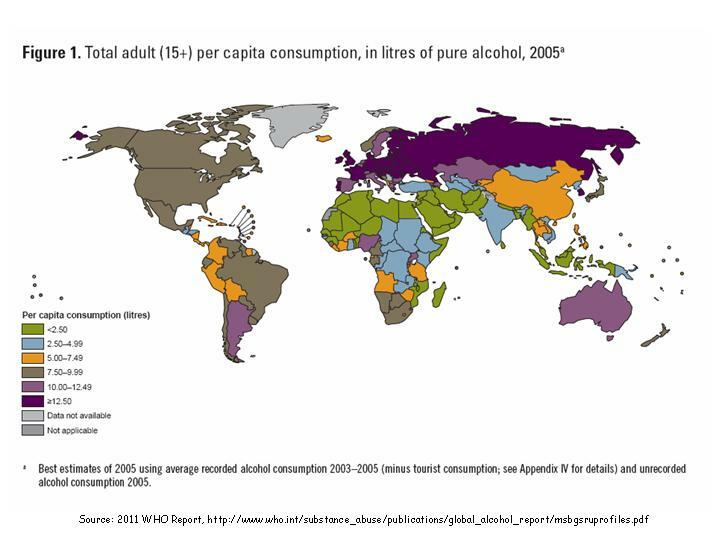 According to the WHO report, global consumption in 2005 amounted to the equivalent of 6.13 liters of pure alcohol per person (aged 15 years or older). 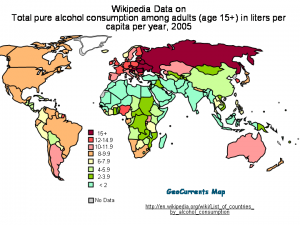 As can be seen from the GeoCurrents map on the left, the biggest boozers are the former Soviet states, except those in the Caucasus and Central Asia (Kazakhstan is only Central Asian state with relatively high levels of alcohol consumption, well over 10 liters per capita annually). Moldovans are the most bibulous, going through 18.2 liters annually, nearly 2 liters more than the second-place Czechs. 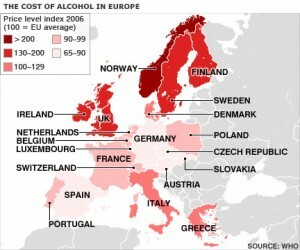 Most other European countries are not far behind, generally consuming 10 or more liters of alcohol per capita a year. One surprising figure is the relatively low level of alcohol consumption in Norway, where less than 8 liters per capita are consumed annually, compared to over 13 liters in Denmark, over 12 liters in Finland, and over 10 liters in Sweden. One possible reason is the high cost of alcohol in Norway, twice the EU average, as shown on the map on the left. Another possibility is the fact that the government maintains a monopoly on selling beverages with an alcohol content higher than 4.75% through Vinmonopolet, although similar monopolies operate in Sweden, Iceland, and elsewhere. Ironically, because of its large size, Vinmonopolet is able to send wholesale buyers around the world to find and procure excellent wines at reasonable prices. The picture in absolute numbers is quite different, however, as can be seen from the cartogram on the left. Here Moldova, Russia, and the Baltic countries shrink, while the European subcontinent as a whole bulges out. China, with its huge population and medium per capita consumption figure of just under 6 liters, stands out as a big drinker; the same is even more true of Nigeria, another populous country whose per capita alcohol consumption rate is above 12 liters. But it is not just the amount of alcohol consumed that matters, but the type and source as well. The world’s top drinkers, the Moldovans, are reckoned to get almost half of their annual alcohol intake in the form of “unrecorded” home-brewed liquor, which is often particularly harmful to health and sometimes even deadly. 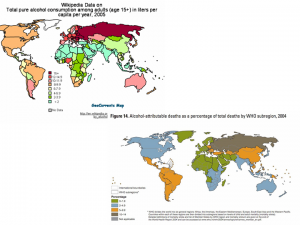 The two maps on the left, depicting the rate of disease and death related to alcohol, present a sharp contrast between Russia and other former Soviet states such as Belarus, Ukraine, and Moldova, on the one hand, and Western Europe, on the other. 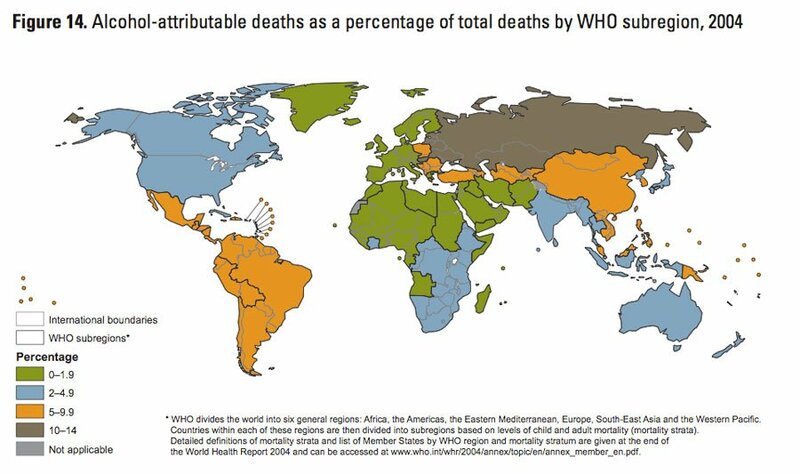 In the former Soviet realm the rates of alcohol-attributable disease and death are the highest in the world, while Western Europe finds itself in the lowest category on both counts. Globally, “moonshine” is estimated to account for almost 30% of the all alcohol intake. The WHO estimates that alcohol results in 2.5 million deaths a year, more than AIDS or tuberculosis. In Russia and its former satellite states, one in five male deaths is caused by drink, which is considered to be one of the main causes of high mortality and low life expectancy among men in Russia. 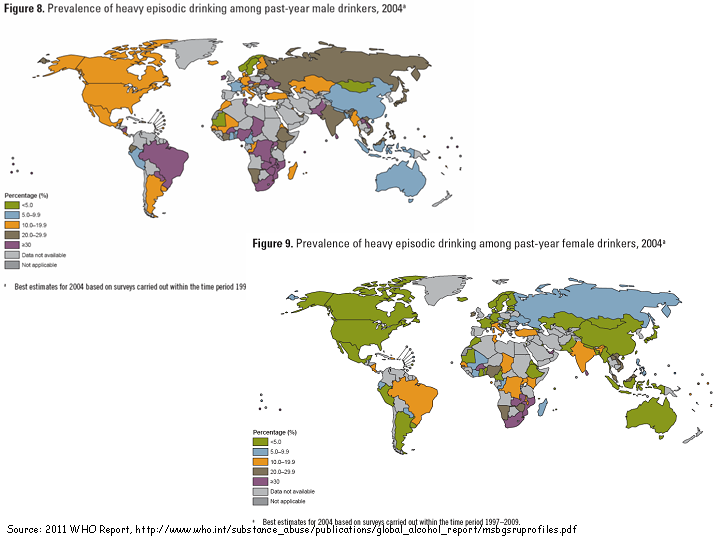 Gender disparities in global drinking patterns are important and intriguing. While no worldwide figures or maps reflecting overall drinking patterns by gender are readily available, the maps from the WHO report reproduced on the left show that global patterns of binge drinking differ by gender. 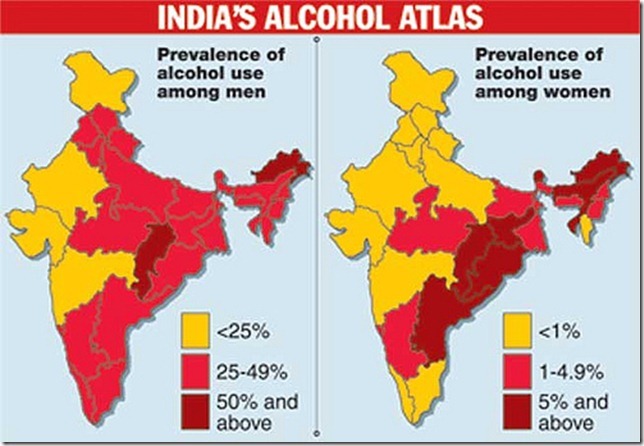 Furthermore, the maps of alcohol use among men and women in India, reproduced on the left, also show how geographically dissimilar such gender-specific patterns can be. When it comes to the legal drinking age, global disparities are instructive as well. 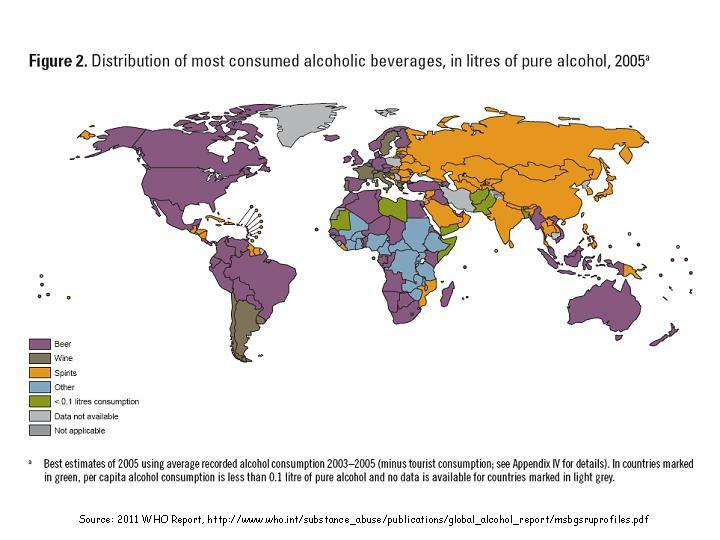 According to the map, only a dozen or so countries prohibit alcohol completely: Tunisia, Libya, Sudan, Somalia, Oman, Yemen, Saudi Arabia, United Arab Emirates, Qatar, Kuwait, Bangladesh, Brunei, Afghanistan, and Iran. (A memorable scene in the film Argo comes to mind in which the American hostages celebrate their daring escape with alcoholic drinks when the plane finally clears the Iranian airspace.) Even this low figure, however, seems exaggerated. Alcohol is allowed in certain circumstances in Tunisia, although Islamist forces are currently trying to enforce complete prohibition. Even in Iran, non-Muslim minorities are allowed to produce limited amounts of alcohol for religious rites. In all of these alcohol-averse countries, Islam plays an important role. But not all Muslim countries prohibit alcohol. Some, such as Indonesia and Pakistan, impose a relatively high legal drinking age. 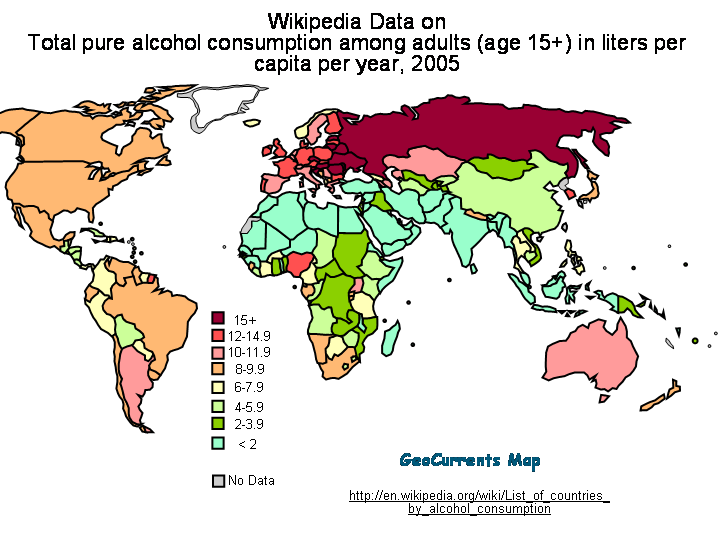 Others, such as Iraq, Turkey, Egypt, Jordan, and Algeria, allow drinking at a younger age. Yet others, including Syria, Lebanon, and Morocco, do not impose any legal drinking age at all. The United States is among the few countries with the strictest legal drinking age limits: only those 21 years and older are allowed to drink legally, placing it in the same category as India, Pakistan, Nepal, Indonesia, and Armenia. Most Western European countries allow 18- or even 16-year olds to consume alcohol legally. Some European countries, such as Moldova, Romania, Serbia, Slovenia, and Greece, do not impose a drinking-age limit at all. As the juxtaposition of the legal drinking age and alcohol-attributable deaths (on the left) reveals, there is no correlation between permissive age limits and alcohol lethality. It has even been suggested that the high legal drinking age limit in the U.S. may encourage binge drinking—which is sometimes lethal—among American college students. Nor is there a direct correlation between the amount or type of alcohol consumed and its lethal effects, as can be seen from juxtaposed maps on the left. 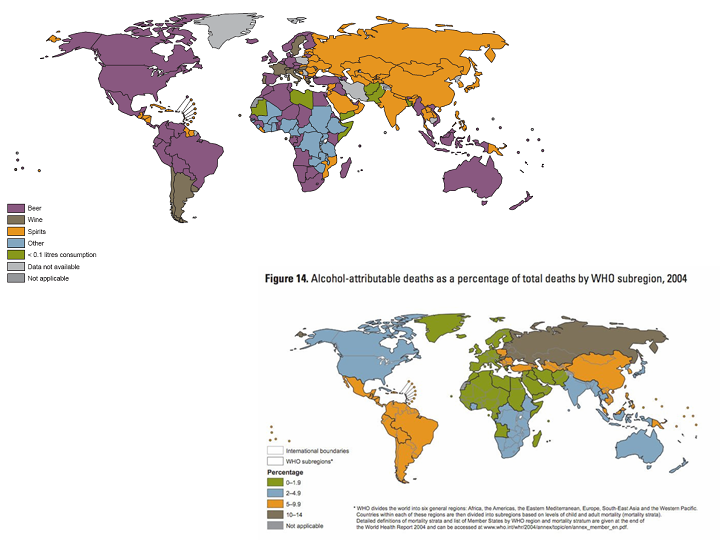 As mentioned above, Western Europeans consume almost as much alcohol as do people in Russia and the neighboring ex-Soviet countries; yet the contrast in the rates of alcohol-attributable deaths between the two areas cannot be sharper. 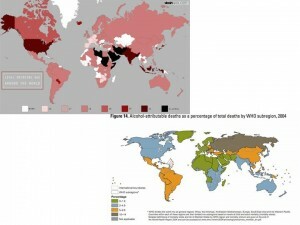 Moreover, while it is true that the highest rates of alcohol-related deaths are found in countries that consume most of their alcohol in the form of spirits (primarily vodka), other spirits-drinking countries, where much less alcohol is consumed overall, rank much lower in terms of alcohol-related deaths. Thus, it appears that a combination of different factors is responsible for the patterns of lethality of alcohol consumption. According to the WHO report, it is not only what and how much people drink, but also how they drink that matters; such patterns are reflected in its Patterns of drinking score (PDS). The PDS is “based on an array of drinking attributes, which are weighted differentially in order to provide the PDS on a scale from 1 to 5”; the attributes include the usual quantity of alcohol consumed per occasion; festive drinking; proportion of drinking events, when drinkers get drunk; proportion of drinkers, who drink daily or nearly daily; drinking with meals and drinking in public places. The countries with the lowest PDS are found in southern and western Europe; curiously, these countries also have high adult per capita consumption. High PDS prevail in Russia, Ukraine, Kazakhstan, Mexico, and South Africa. South America (with the exception of wine producing Argentina), and many countries in Africa and South-East Asia, take an intermediate position. Focusing on the type of preferred drink, several interesting patterns emerge. Spirits play an important role in the world’s drinking hot zone: Russia and Eastern Europe. It is also the drink of choice in most of Central, South, East, and Southeast Asia, though Vietnam, Myanmar, Malaysia, and Indonesia prefer beer. Spirits, chiefly rum, are also popular in many Caribbean and Central American countries. Western and Central Europe are split between wine- and beer-drinking countries. The former category includes such major wine-producing countries as France, Italy, Portugal, and Greece, as well as Slovenia, Switzerland, Croatia, Slovakia, and Moldova. Perhaps surprisingly, Spain finds itself in the “beer camp”, while Sweden groups with wine-loving countries (though in the latter case the preference is slight). Another major wine-producer, Georgia, appears to prefer spirits. Outside of Europe, the only countries where wine drinking predominates are such major wine-producers as Argentina and Chile, as well as Uruguay. Elsewhere in the New World, beer is the drink of choice. Africa exhibits a more patchy pattern. While some African countries consume most of their alcohol in the form of beer, other countries are placed in the “other alcohol” category though beer is very popular there as well (for example, Guinness Stout is the local favorite in Nigeria). It must be remembered, however, that in most parts of Africa the amount of alcohol consumed is fairly modest, and much of it is in the form of “unreported” homebrew, generally made from millet or corn (maize), so it is hard to specify the preferred drink. 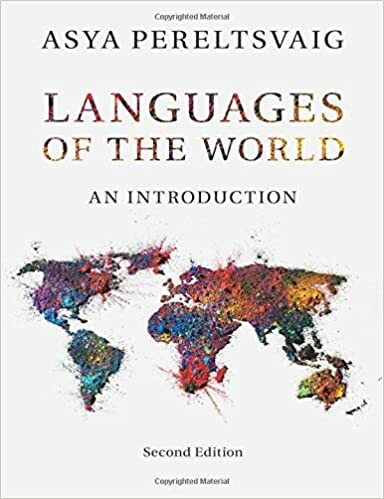 One cautionary final note pertains to the sub-national patterns: as is always the case when data is aggregated over so-called “nation states” (many of which have no cultural cohesion), more localized patterns are lost. As noted in an earlier post by Martin Lewis, which started this mini-series, France—an overwhelmingly wine-drinking country—has its beer- and cider-drinking regions. 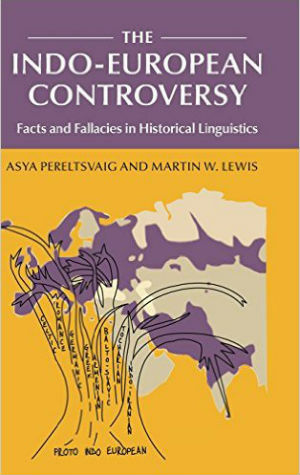 Moreover, patterns of alcohol consumption, like all other patterns of human geography, change over time. 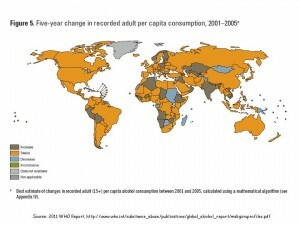 An earlier series of GeoCurrents posts by Martin Lewis discusses such changes in drinking patterns in the U.S. (see also here and here); the map from WHO report reposted on the left shows how alcohol consumption changed from 2001 to 2005.